How the factor of mortality has informed our society, our myth, ritual, and art is the main subject of the new book Death: A Graveside Companion (Thames and Hudson/2017). Joanna Ebenstein, a founder of Morbid Anatomy, is the editor of this tome and has called upon the MA community to pepper it with essays focusing on their fields of expertise and obsession. And speaking of obsession, nearly all of the 1000 images illustrating the chunky edition come from the collection of Richard Harris and represent less than a third of his overall archive. Though the Morbid Anatomy Museum’s physical home in Brooklyn was lamentably laid to rest, those responsible for the project continue to work with other venues to offer events and lectures within the same scope of interest. On Saturday October 28, 2017 The Green-Wood Cemetery hosted a day-long symposium “devoted to the curious intersections of art and death,” to help launch the book. Many of the essayists were on hand to speak about and expand on their texts and answer questions from the full house of attendees. Held in the cemetery’s chapel, it was great to see familiar “museum friends” both presenting and in the audience. Opening comments by Ebenstein focused on the ability of these depictions, ranging from fine art to clinical scientific illustration, to both “startle and intrigue.” Her previous book The Anatomical Venus presented images of wax medical manikins from the 18th & 19th century photographed in a disquieting crossroads of scientific accuracy and Hollywood glamour portraiture. Essayist Mike Sappol followed this lead with his talk titled “The Afterlife of Death,” a consideration of early anatomists and the expectation that they not only educate but entertain with more and more spectacular depictions of dissected human bodies. In addition to the talks, collector Joel Schlemowitz projected a selection of his Magic Lantern slides. Think of them as a Victorian precursor to PowerPoint. Schlemowitz’s research into media antiquities includes his documentary film 78RPM, a loving look at Gramophone collectors around the world. 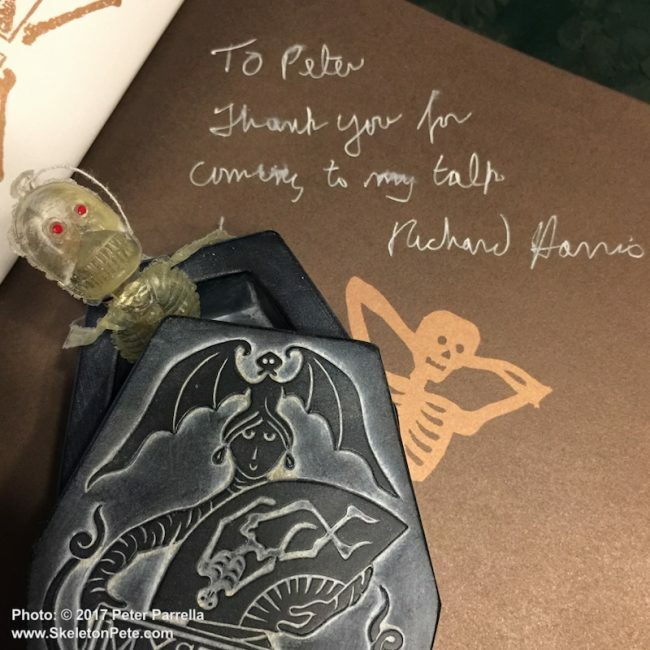 A collaborative symposium between Morbid Anatomy & Green-Wood Cemetery offered insight into the juncture between mortality and art. During the symposium, remembrance pieces were explored on several levels. They included Karen Bachmann’s guide to the keepsakes of Victorian hair jewelry, Evan Michelson’s restoration of a miniature cemetery diorama in her collection, and Kevin Pyle’s current narrative panel art. The memento mori, is often interpreted as a sentimental item by which a departed loved one is remembered, but it is also a shoulder shaking wake up call that all existence is impermanent. 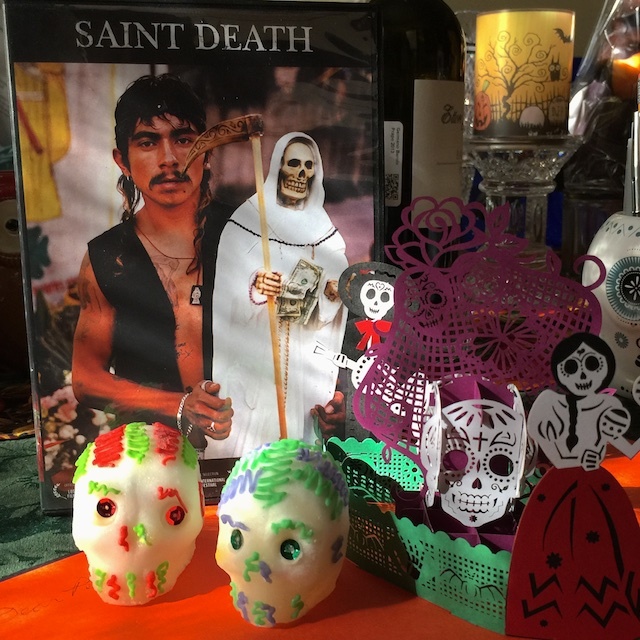 Connection to the afterlife in Meso-American was highlighted by filmmaker Eva Aridjiis who spoke about Mexican culture and Day of the Dead (Dia de Los Muertos) rituals. Her excellent film documenting the veneration of outsider icon Sante Muerte (Saint Death) was screened at a previous collaboration between Green-Wood and Morbid Anatomy. Morbid Anatomy Library Curator Laetitia Barbier focused on her fascination with the guillotine and the imagery of the severed head from the myth of Medusa, the biblical account of John the Baptist’s beheading at the request of the spurned Salome, to the French Revolution era death masks. Barbier’s talk reminded me of the working guillotine I built which was part of the Madame Tussaud’s Chamber of Horrors series from Aurora plastic models. My Mom hated it. It was as good as gone when it entered the house, but I might still have the little gent with the loose noggin somewhere in my collection. Basement archeology will ensue. Transcendence of impermanency – contact with the afterlife – was explored by Sharron Taggert, and in the short films of Ronni Thomas. They looked at various methods of spiritualism including orb photography, manifestation of ectoplasm, Plancette (Ouija Board,) and seance. Taggert’s own spirit photography will be featured in her book, Séance, scheduled for release shortly. As work I was previously unaware of, I found Marie Daunheimer’s talk on the art of Théodore Gericault particularly fascinating. In pursuit of anatomical accuracy for his epic painting The Raft of Medusa Gericault apparently turned his studio into a charnel house, with severed limbs artistically arranged for preliminary studies. 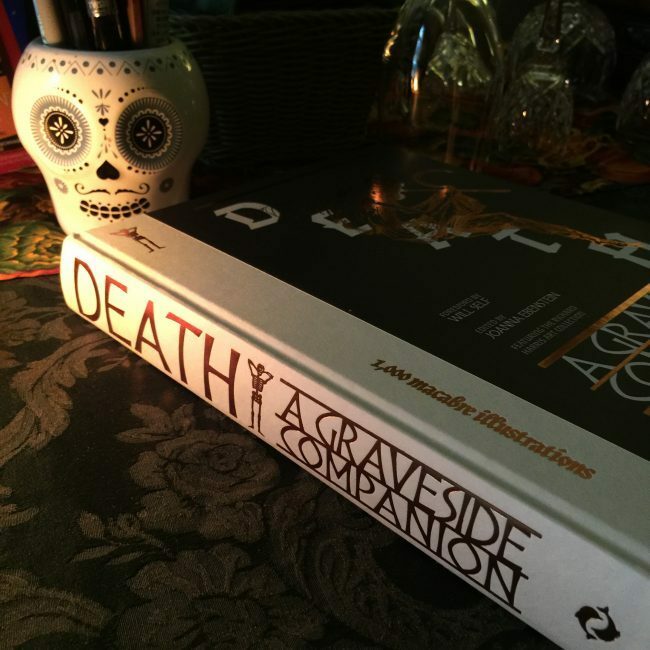 Death: A Graveside Companion is chock full of images and information to make any fan of the macabre do a bone rattling jig. As someone who has consistently woven skeletal imagery into my own projects it is hand’s down, my favorite book of 2017.